6.13 points at 16 votes (rank 609). No time for species conservation: the Sabre Man carves through the wilderness. 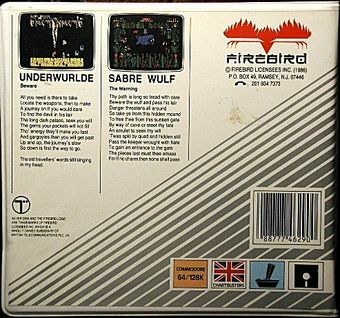 Sabre Wulf is an action adventure, that was originally published by Ultimate for the ZX Spectrum in 1984 and ported to the C64 by Firebird in 1985. 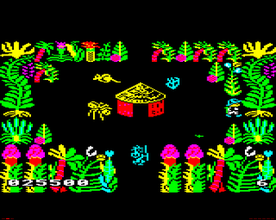 The player controls the brave Sabre Man on his search for the four parts of a charm through a jungle labyrinth the size of 256 screens. At the same time he is hassled continously by the aggressive fauna, against which he can defend himself with his sabre. But there are also indestructible enemies, as e.g. the dreaded Sabre Wulf, from which you can only take flight and ghost lights that rouse the player if he lingers too long. Exotic orchids and sporadically spread bonus items and extra lives help the Sabre Man fulfilling his mission, which is successfully done, when he has collected all parts of the charm and enters the cave in the heart of the jungle. At the end of the game there is an evaluation in percent that shows how many screens of the labyrinth you have visited. In the follower game [[Underwurlde], the adventures of the Sabre Man are continued. Although it might look like it: the aim of the game is not to run around in circles without sense. 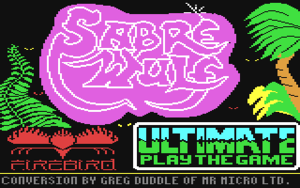 When porting Sabre Wulf one has obviously played it safe and created an almost one hundred per cent clone of the ZX Spectrum original. 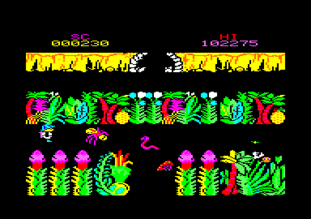 This is especially visible through the use of the black background and the multicoloured but nevertheless spectrum-like design of the jungle vegetation, as well as through the unicoloured, simply animated sprites. The fencing movements of the own character are designed more elaborately, but they still seem rather choppy. With bigger animals such as the rhino or the Sabre Wulf one can also notice a distinct flicker. There is no scrolling, instead the screens are changed by the flick-screen-technique. The simple-kept sound effects also correspond almost completely to the original version, they only sound marginally better through the use of the Sid-Chip. There are three short jingles playing at the start and the end of the game, as well as when collecting a piece of the charm, and are next to the title melody - once again Bach (BMV846) (Video at YouTube ) - everything that the game has to offer musically. 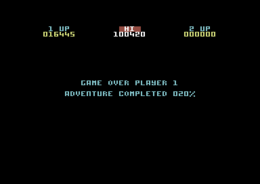 There is a highscore list, but it is not saved. The hero of the game. He starts with four lives and can only get more of them by collecting statues . 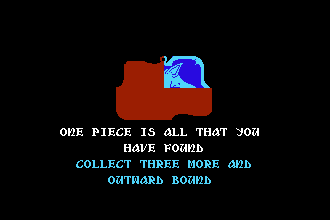 His task is, to find the four parts of the holy ACG (Ashby Computer & Graphics) charm and then reach the cave, which else is blocked be a shaman. With his masterly handled sabre he can defend himself against the insubordinate inhabitants of the jungle, although only to the left and right - the Sabre Man is unprotected from top and bottom. Furthermore, the jungle is plastered with sundries of bonus items such as, diamonds, swords, water bottles and of course sacks with loads of dough, which can be collected and each get you 150 bonus points. A first piece of the charm has been found. 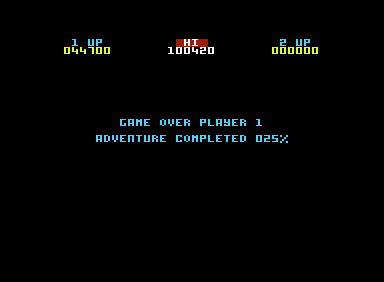 yellow: All enemies in the screen are killed and the Sabre Man sits down narcotised on his trouser bottom for a few seconds. During this time, however, he is immune to natives or big game. red: Sabre Man gets invulnerable for a few seconds but is also slowed down. purple: Here also Sabre Man gets invulnerable for a short time, but additionally the controls are turned around (left is right and so on). turquoise: the best of all colours: invulnerability and turbo speed! white: This colour neutralizes the effect of all other colours that currently effect Sabre Man. Very useless. An endless stream of tarantulas, snakes, scorpions, bats and other animals materializes non-stop in every screen and can easily be chopped by Sabre Man with his sabre. Every killed animal gets you between 165 and 195 points. Rhinos and hippos love lying around on crossroads and block it with their handsome embonpoint. These pachyderms cannot be killed, but at the very most be motivated to get up with a well-placed prick in the rear, after which they panically take their heels. Attacking big game can be brought to turn around by Sabre man with blow of the sabre onto the nozzle. The natives are on the warpath and dash from screen to screen. They can also not be defeated with the sabre, they just turn around after you have hit them with the sabre. The name-giving chief villain of the game: an oversized, prehistoric wulf, which patrols the lower rim of the screen, always on the search for a juicy Sabre Man, which he hunts and mangles mercilessly. This beast is totally immune to attacks and the only possibility to escape him is to instantly take flight or pass him quickly with the help of the turquoise orchid. These strange creatures form, if Sabre Man lingers too long in one screen. They are completely immune to attacks and a touch is always deadly. If you make it to stay on the screen with a ghost light for about 30 seconds, it disappears shortly and you get 195 bonus points. Little guy, big shot: Sabre Man chases an unruly rhino. The end of the game. Instead of an end screen or a congratulation message, there is an advertisement for the next part. What cheek! 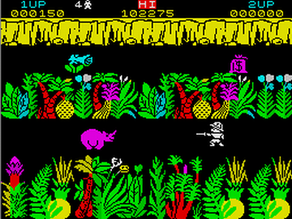 At the start of the game you have to wait in the screen just above the starting position until the rhino has passed you at the right side. If you are not fleeing from the Sabre Wulf, it is recommended to run around the area with fire button pressed (fencing), to be able to defeat spontaneously appearing animals early enough. If you plan to sneak past sleeping big game in southern direction, you can manage this with pressed fire button and a bit of practice. Otherwise it is advisable to first gain invulnerability with an orchid. To avoid, that the ghost light appears, just simply change to the neighbouring screen and return. The parts of the charm are always on clearings, never in normal corridor screens. To get an evaluation of 100%, you need to have visited all 256 screens "twice" before you enter the cave. 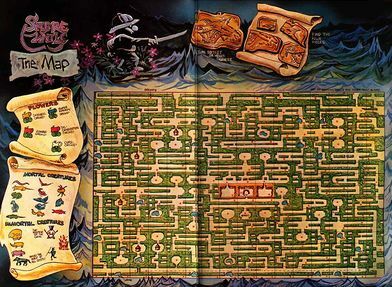 A drawn map of the game (click to enlarge). 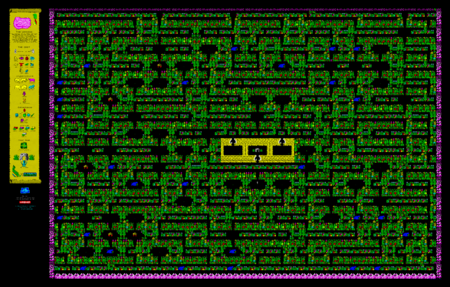 Map of the game consisting of screenshots from the Spectrum version (click for bigger image). The version by The Remembers (TRE) has trainer options. The subsequently built in highscore saver however produces first graphic bugs and then crashes the whole program after entering a name into the highscore list (tested in CCS64 and Vice Emulator). Critic in Happy Computer Games Special 3/85. Robotron2084: "Seen in the historicaly context it is surely a milestone in the action-adventure genre, at least on the Spectrum. But what we got here on the C64, looks to me rather loveless, it is too similar to the original version, which in my opinion can be played on the spectrum with much more grip. Sabre Wulf is far from being a conversion catastrophe as e.g. Jet Set Willy, but it could have been a bit "more". Flickering sprites and unfair situations as long vertical corridors, in which you can neither fight nor sidestep or natives, that run you over out of the blue, dampen the fun in the game. 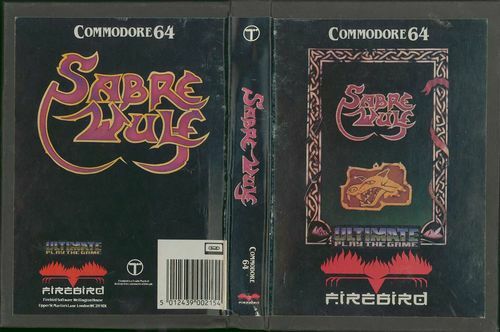 However, Sabre Wulf is an above-average game all in all, which inspired dozens of imitators, as e.g Robin of the Wood, Starquake or Firelord, whereby especially the latter two outrank the prototpye without any problems. 6 out of 10 points." A Sabre Wulf is hidden in this picture. Can you find it? 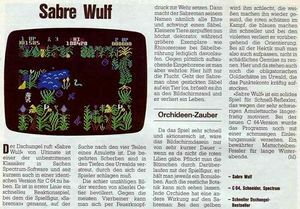 When Sabre Wulf was released for the ZX Spectrum in 1984, critics mentioned the too strong resemblance with the forerunner game "Atic Atac". 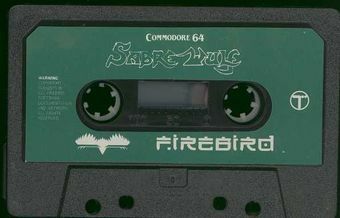 It still counts as the game, that made it "acceptable" to raise the average price of ZX Spectrum game software to £9,95. But also there was partially criticism: "To much make-up, to little game" was the contrite opinion of testers and consumers. 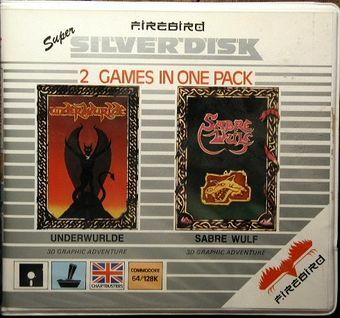 The Sabre Man sage spans over altogether four parts on the ZX Spectrum: Sabre Wulf, Underwurlde, Knight Lore and Pentagram. The fifth part "Mire Mare" was never released. 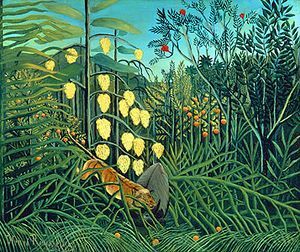 When taking a closer look, the design of the jungle in Sabre Wulf reminds one of the jungle picture of the French painter Henri Rousseau. 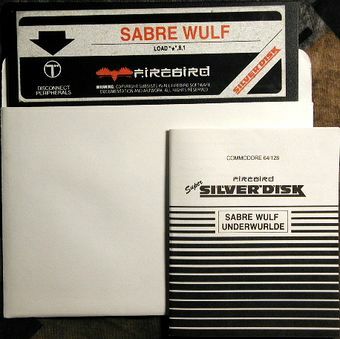 Sabre Wulf LIVE played on a real C64. Front and back of the cassette version. 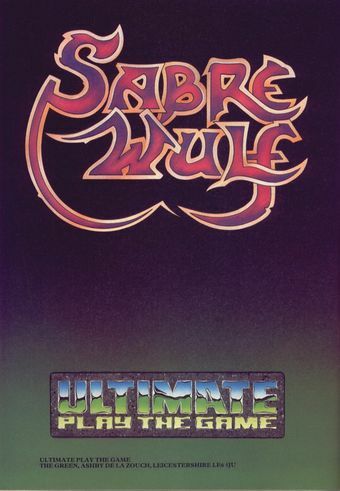 Sabre Wulf combined with Underwurlde on disk.